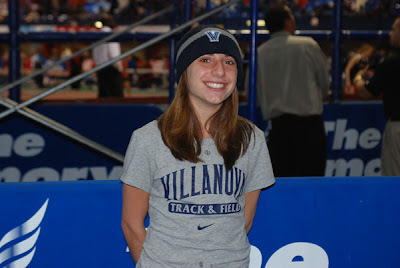 Emily Lipari won the mile at yesterday's Albany Great Dane Classic at NYC's Armory. Her time of 4:42.35 is the NCAA's 5th fastest mile on the books so far this indoor season, and is 4.5 seconds faster than her 2011 indoor best. In the same race freshman Courtney Chapman ran a new PR of 4:49.08 (over 13 seconds faster than the mile she ran last weekend at this same venue); it was also good for a ticket to the Big East championships. Other noteworthy efforts came from Nicky Akande, who finished 2nd in the 1000 meters in 2:50.37 (two seconds off her 2011 season best) and a Big East qualifier. Frosh Stephanie Schappert came third in the 800 in 2:12.74. Eight other Villanova women attained Big East championship qualifying marks.